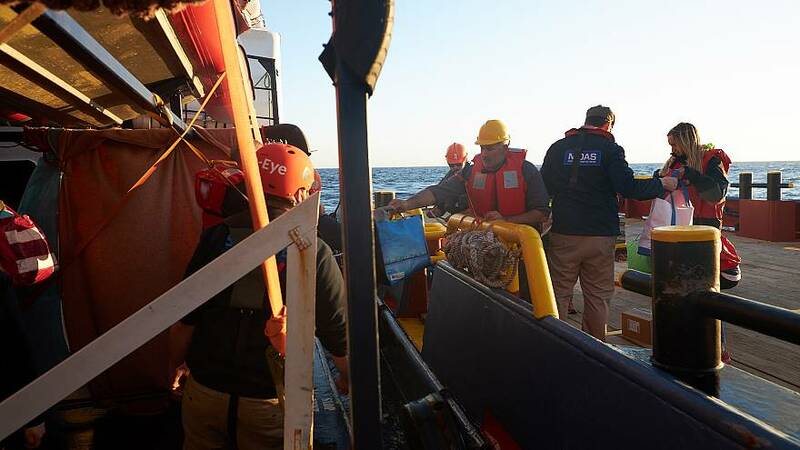 A Maltese relief organisation delivered emergency supplies to the Alan Kurdi ship on Tuesday, which has been awaiting authorisation to dock for the past seven days so that the 64 rescued migrants onboard may disembark. Malta's MOAS NGO delivered emergency food, water, medicines, dry clothing and blankets to the Alan Kurdi, run by the German-registered NGO, Sea-Eye. "Italy and Malta repeatedly referred to Libya's jurisdiction. This is the same country whose capital has been surrounded by military troops for days. There is heavy fighting going on," Gordon Isler, chairman of Sea-Eye, said in a statement. A young woman had to be evacuated on Monday for medical reasons after complaining of dizziness and losing consciousness. Sea-Eye said the Maltese authorities reacted promptly but warned that "we have to expect such situations to increase if these people are not allowed to move quickly to a safe place". "The political leaders now have to act responsibly," Jan Ribbeck, the ship's operations manager said in a statement. According to the organisation, the conditions on the ship are cramped with people forced to stay on the deck 24/7 where they are exposed to the elements. "They freeze, they get wet again and again and of course no one has a change of clothes with them," Ribbeck said. The ship has a fixed capacity of about 20 people, Sea-Eye's Carlotta Weibl confirmed to Euronews. "There are not enough sanitary facilities for so many people. The ship is also simply not designed for so many people. In other words, the situation is very depressing," she added. The NGO lamented that it has not been kept abreast of the ongoing negotiations between EU member states to take the migrants in. It warned however that it was considering suing the bloc's authorities. "The ongoing negotiations and the political question about the distribution of the rescued, through various EU member states, overshadow the human rights of the individuals on board the Alan Kurdi," a spokesman for Sea-Eye said.